No one has added a helpful site for this 2016 HR-V problem yet. Be the first! After reading the complaints on this thread, I realize that my symptoms are not "in my head". I too, am experiencing lower back and hip issues, migraines and I now have a pinched nerve in my left arm that radiates down to my hands making my entire left side numb. To back track, I turned in my 2014 Honda Pilot that I was leasing and decided to lease the HR-V. In hindsight the Pilot was AWESOME and COMFORTABLE for long trips especially my hour long commute into work. So, when my sister and my husband suggested I get the HR-V since my commute was cut in half due to me now living and working in NJ I could save money in gas, I decided to stay in the Honda family and lease the HR-V. THIS IS THE WORST DECISION I HAVE EVER MADE IN A CAR LEASE OR PURCHASE. Little did I know, a few months into leasing this car, I would start to experience some major health issues that I first attributed to me just having some change in life issues. About three months into driving my HR-V I started to experience terrible migraine headaches, and also lower back pain issues. I went to my PCP who suggested taking OTC meds, etc. for the pain and to continue with some yoga and Pilates. My migraine and lower back issues did not resolve but worsened. The migraine headaches were getting worse and now more frequent. My PCP and my neurologist both could not figure out why my migraines were more severe and increasing, so I was placed on different migraine medications with no cure. Fast forward to a new promotion on my job which now requires me to commute at least 3 hours a day (1.5 both ways) and my symptoms have now increased along with the pinched nerve issue that just started 2 weeks ago. My husband took pity on my and bought me a back massager for this car but this only provides temporary relief. I also thought I could stick it out since I have another year on my lease but I don't think I can handle the pain any longer. I am truly too young to feel this way just from driving a car. I thought about letting my husband drive it but he is 6ft tall and a big guy so he doesn't feel comfortable driving it, nor does my son who is taller than me. I am on the shorter and petite side (5"4') and this car is literally killing me. My chiropractic bills are through the roof along with me taking too many medications to manage all of the pain I am in. Its not worth it long term. I dread driving this car and cannot see allowing someone else to experience the type of pain I am constantly experiencing. Any suggestions would be appreciated. Thanks. Back seats are horrible, uncomfortable, passengers cannot sit in them because you have to turn the headrest around or remove them. If you raise the headrest in the back it obscures the drivers inside rear vision! Go on a trip and you are beaten to death in the back seat. I have been noticing thoracic and low back/hip discomfort approximately 3 months after purchasing this vehicle. I have purchased different seat cushions and back cushions with no relief. I have now been driving long distances for two months and have been in miserable discomfort upper and lower back. I did not think about the seat being my problem until recently. I am considering one more back and seat cushion purchase and if no relief, I will be trading this car in for another car. My daughter purchased a Honda Civic and has hip and low back pain; she drives long distance as well. 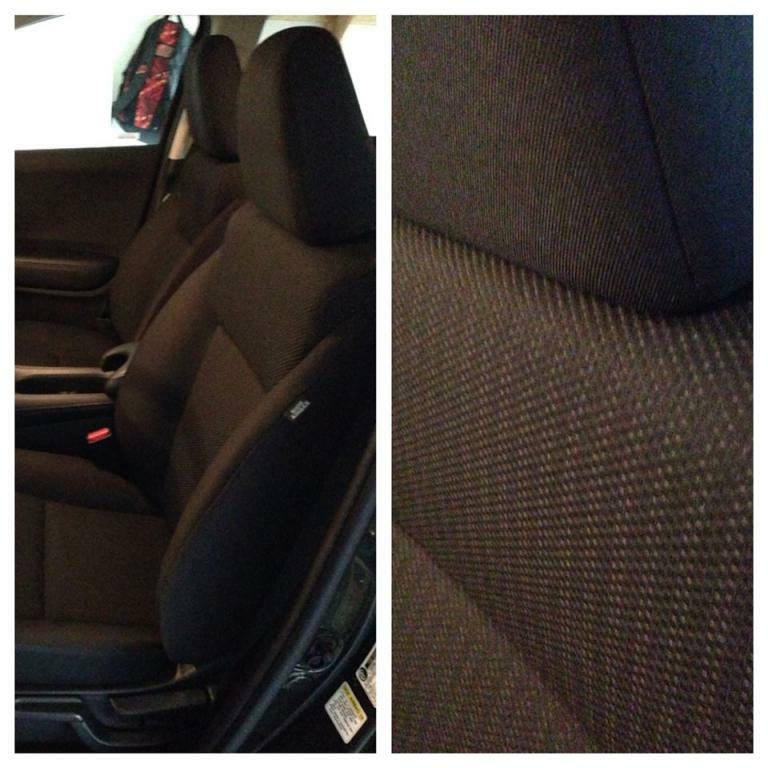 Two Honda owners with purchases several months apart with same back issues....something is wrong with the seat design. We bought this car in July 2015. Within the next month I began having back problems, hip problems and terrible headaches. I have spent the better part of the last two years off and on in bed due to the migraine headaches and back pain from the seats in this car. The headrest forces your head into a "head forward" position--for short people, like me, (I can't vouch for those taller than me) this headrest basically makes you tilt your head down with your chin toward your chest. That may be ok for a minute or two, but after that it begins to wreak havoc on your body. I understand that the headrest is meant to protect a person from whiplash in an accident, but it has inflicted worse than that on me. Forward head posture can cause a chain reaction of symptoms in your body...everything from Bruxism (which I now have) to poor body alignment which can cause back pain, hip pain, shoulder pain and migraine headache...all of which I now deal with regularly. I periodically have to deal with my hand going numb...I'm guess it is beginning to lead to nerve issues. It took me a while to figure out why these things were happening to me but it all makes sense. Honda, from what I understand, is avoiding dealing with this. I wonder does there need to be a class action law suit. I have expended thousands of dollars dealing with the medical issues this has given me. Honda needs to take action. Have had the car for 6 weeks. Most uncomfortable seat ever. I had to drive 3 hours on a trip and when I got out I was holding on to the car and felt like my legs would not work. I had to stretch and bend to get moving. I am in the process of getting rid of this car. I would not recommend it to anyone. Drove this Honda HR-V as rental for 3 weeks (still driving it). Started noticing a pain in my lower back, but did not associate it with the driver seat because it actually felt comfortable, Had to do a lot of driving throughout each day, and the pain got worse. Finally, I realized that this pain began when I started driving the car, and if I didn't drive it first thing in the morning, the pain would ease a bit. It got to the point where I now can't find a comfortable position, and yes, the seats are manual and don't have much adjustment leeway. I finally decided to check if there were any similar complaints about the HR-V, and found this site. Everyone was pushing me to buy this car. Now, I won't buy any Honda at all. I'll go back to Ford, or try a Toyota. Leather drivers seat not comfortable AT ALL. 3rd Honda with same issue (2007 Accord coupe and 2012 Insight). How is it that they just cant make a comfortable seat? Mazda and even KIA/Hyundai have excellent comfortable seats. 2 weeks of ownership and just cant get comfortable. Also, in my preferred driving position I am unable to see the speedometer! I have to drive with my old nav system attached to windshield to see the speed I am driving. I bought the 2016 HR-V on May 19, 2016, this was my second new Honda, I also had a 2014 Accord EX-L. The seat in this vehicle seemed decent at first, better than the horribly sculpted 2014 Accord seats that had fixed lumbar poking your back 24/7. I am 5'7 and 180lbs, pretty average. About 1 month after purchasing it, I started to notice how poorly designed the seats and seating position were in the HR-V. The seats have fixed lumbar and a poor range of motion, all HR-Vs have manually adjustable seats. The seating position is awful, I feel like I am either too close to the steering wheel or too far away. The wheel itself is angled in such a way that after about 1 hour, my hands start to go numb. I've been driving for 45+ years and these two Honda's are the first vehicles I've ever owned with contortionist seating positions. They engineer all these groundbreaking technological feats and can't master seating ergonomics?! I'm done with Honda! There are so many good options in today's market, don't waste your money like me on a Honda. I'm going back to Toyota, the seats in my 2012 SE were phenomenal, I felt refreshed after a 6 hour roadtrip...now I feel like a 90 years old with rheumatism in my Honda. I've owned my Honda HR-V for a little over a week now. I LOVE the car...the handling, the sound system, the controls -- everything --- except...the driver's seat. I've tried nine ways to Sunday to make it comfortable -- to no avail. On the way home from the dealership after first purchasing the vehicle, I noticed a tightness in the left side of my neck and shoulder. The next day, I adjusted the seat thinking it was just me not being used to a new car. By the time I arrived at work I had numbness in the left side of my jaw and a migraine starting. So...again...I adjusted the seat on the way home, but I still had the pain. The next morning, I was pain free, however, 10 minutes into my ride to work the pain started again. By the time I arrived at my office 30 minutes later, it was so bad I took 4 ibuprofen to try and mitigate it. No relief. Each day it was the same thing, but it was really awful after a drive to a meeting. 1.5 hours in the car was excruciating. The next day I had my co-worker sit in the passenger seat while holding open the manual showing the correct "posture" for driving. We adjusted the seat as instructed. Last Saturday I attended an event 1.5 hours from my home and arrived home later that evening nearly in tears due to the pain I was experiencing. I searched on the internet and have found that neck/shoulder pain is a common complaint with not only the HR-V but also CR-V. One forum posting going so far as to suggest you should hire a chiropractor if you decide to buy this vehicle. Yesterday, I traveled 2+ hours to/from a work event and at this very moment am icing my neck because the pain has not subsided I’ve tried using an Obus Forme support – it does not help. I ordered a neck support and lumbar support which have helped slightly but not enough. I have an appointment at the doctor tomorrow. If you are considering this vehicle, be sure to sit in it for an extended length of time and test drive it multiple times. I was excited about this vehicle but after purchasing and being able to drive it for an extended period of time, I noticed a pressure point in my mid-back. It got to the point where it would take as little time as my 7 minute commute to cause my back to go numb. This numbness would persist for several hours after getting out of the vehicle. This was a problem with the driver seat as well as the passenger and back seats. No amount of seat adjustment would alleviate this problem. It wasn't until later that I read articles of other Honda vehicles having extremely uncomfortable seats. I had to trade my car after 1 month of ownership. Honda had no concerns for my discomfort suggesting only that I try seat adjustments or put a pillow behind me. I shouldn't have to sit with a pillow in a new car. One dealership even tried to convince me that I should have leather installed over the seats or trade for another Honda.. After just one month it had already depreciated 30%. I can only hope that this doesn't happen to other unsuspecting Honda customers. I had a 2006 Honda Accord EX coupe for 10 years that I loved!, but it was time for a new car. After reading about the awesome HR-V, I decided this could be the car for me. The versatility is amazing and would be perfect for my active lifestyle. Unfortunately, I didn't take into consideration, nor did I think, that this car would be that different from my Accord comfort wise. Boy was I wrong. The lumbar juts out, but then the seat above that pushes my shoulders out. That along with the active head restraint forces me to sit in a very unnatural position. Currently I'm trying towels, etc. to figure out a way to make it work, but I don't see myself in this car for very long, and I really don't see myself in another Honda if they don't fix this problem!